CONDUCTED AND TRANSCRIBED BY STEVEN STREUFERT, WITH ASSISTANCE FROM "C.I." FEBRUARY 4th, 2010: PART ONE OF THREE. This is the first forty minutes of an interview that lasted over two and a quarter hours. The rest will be posted here soon in two more segments. Al Hodgson debunks the "Bluff Creek Massacre" theory, denies that Bigfoot are human, and throws one more question mark into the issue of the actual location of the P-G film site. Audio recordings are archived, lest some of you conspiracy theorists doubt the veracity of the following literal transcriptions. Bigfoot Books and our associate and soundman "C.I." went up the hill and around the corner, about a quarter of a mile from the book shop, and visited Bigfooting elder statesman, Al Hodgson. He's lived in Willow Creek since 1933 (and was born before that!). Now in his mid-eighties, he was there on the ground when "Big Foot" went from being a local legend to an international sensation. 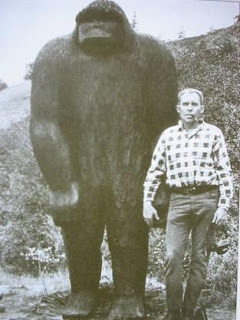 In fact, he played an instrumental role in that crucial period of 1967, and made the phone call that brought Roger Patterson and Bob Gimlin to Bluff Creek, leading to the famous filming of the creature. He was prominent as a local contact for all matters Bigfooty for decades, and participated in the early investigations of footprint finds and sightings. 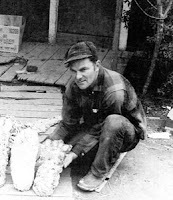 He knew Jerry Crew, who made the famous Bluff Creek casts of 1958, personally. 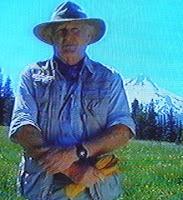 As a member of the Willow Creek-China Flat Museum he was the guy who made the famed "Bigfoot Collection" wing happen, thus preserving the Bob Titmus materials and casts, and presenting other archival and historical materials in a domain accessible to the general public curious about Sasquatch evidence and history. Images: Al in his home this February, holding the book Roger Patterson gave and inscribed to him. Below, the dedication and signature from Roger. Photos: by Steven Streufert. CLICK TO ENLARGE most images. The discussion began as soon as we entered the front door of the Hodgson home in Willow Creek, CA, and covered some interesting ground before we could even get the recording device and microphones set up. What follows is a transcription, literally done, but with “ums” and “ahs,” “likes,” “you knows” and other extraneous bits mostly edited out for concision. We were sitting at the table for about five minutes before the first words were recorded. A discussion about the “human-ness” of Bigfoot was in progress. 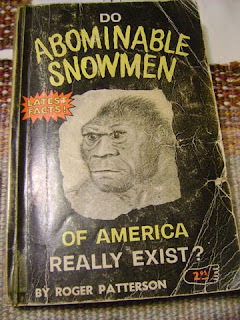 Sitting on the table before us are Al’s copy of Roger Patterson’s book, Do Abominable Snowmen of America Really Exist? 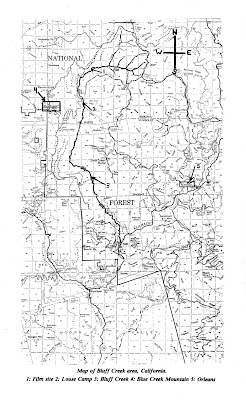 (later to be revealed as personally inscribed by the author), a Six Rivers Forest Atlas topo book, some computer printouts of various photos from the Blue Creek Mountain film shot by Rene Dahinden in 1967 (before the Patterson-Gimlin Film/PGF was made) and an outline of the events of 1967 in the Bluff Creek and Willow Creek areas (private notes not shown to Al) as found in John Green‘s book, Sasquatch: Apes Among Us. AL HODGSON: Well, if you’ve got, if you can…. Yeah, right. It’s OK to disagree as long as you don’t fight, you just talk about it. BIGFOOT BOOKS: You don’t end up hating each other, and throwing around insulting accusations back and forth. HODGSON: I wouldn’t do that anyway. I tend to be the other way. HODGSON: I’m not a fighter. You can get me mad enough that I WILL fight, but it’s quite a bit… (laughs). 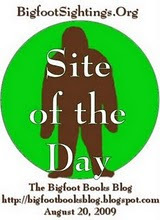 BIGFOOT BOOKS: And so one group believes Bigfoot is human, and the other one, oh, it’s an ape. And it goes from there. HODGSON: Well, I flat don’t believe that it’s a human. I mean Dave Paulides seems to think so. I don’t think so. I can see some things that would give you the idea. I don’t think so. HODGSON: Yeah, that still doesn’t mean, that still don’t mean, it’s a hard… Until you get the beast itself, or you get some DNA, but even that, DNA might not prove it. I don’t know. 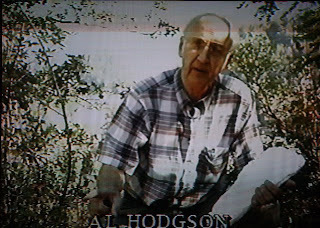 Images: Above, from Patterson's book; below, Al in the A and E Bigfoot documentary. BIGFOOT BOOKS: Yeah. To say it’s human you kind of have to say it acts like a human, too. There are "wild people," but they still have culture, religion…. HODGSON: But they can be tamed quite easily. I shouldn’t say "tamed," it‘s kind of a poor word…. HODGSON: Yeah, civilized, better word for it. BIGFOOT BOOKS: And so it’s hard to imagine that if they could catch a Sasquatch, that they would be able to keep it in a King Kong cage, let alone in a classroom, or a job. HODGSON: Oh yeah, oh yeah. Well, there’s stories how they’ve found…, and that one captured that one time up in Canada, you know…. BIGFOOT BOOKS: Back in the 1800s? Jacko? HODGSON: It’s a different animal, you know; but that doesn’t necessarily mean that they are…. BIGFOOT BOOKS: As far as the human thing, since we’re talking about that: It’s a major issue right now. Certain people like Dave Paulides, M.K. Davis and Bobbie Short, they're on the one side; and John Green is on the other side, more the ape crowd. 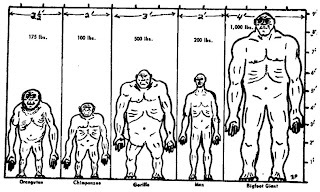 It seems that these divisions have gone further than just whether it’s a human or an ape, its taken on a whole theoretical, almost political, division between the two. BIGFOOT BOOKS: Well, that’s part of what I was hoping to ask you about, you might know some things…? BIGFOOT BOOKS: Blue Creek Mountain? Images: Blue Creek Mountain track, above; John Green's book; a photo taken by Green on Onion Mountain, from the trackway find that preceded the one on BCM by a few days (Onion Mountain is on the same road, right next to BCM). BIGFOOT BOOKS: I have pictures here, you know, from M. K…. But also, Dave Paulides was saying that they found this film in the archives of Ray Crowe, in the Western Bigfoot Society archives, that was an "uncut," earlier version of the Patterson film that had bits that "no one had seen before." And, you know, acting as if these were the same film, rather than spliced together for a documentary or whatever. BIGFOOT BOOKS: After the film was shot, the Patterson film? HODGSON: Yeah, right, right. About, I think, it was about June. HODGSON: Ah yeah, sure… But anyway, we went up there, and John had every slide, every… of the… part of the film, he had a slide made of every one of ‘em, every frame. And he would, told me, I was out in front of him, and this time all the leaves from the fall had fell and covered the whole thing, and it hadn’t washed through there. The river, it never got a hold of it, never had any real high water. BIGFOOT BOOKS: Ah yeah, that sandbar sits up a bit from the creek doesn’t it? HODGSON: That’s right. And it… Nothing got in there, OK? And he’d take that and look out through it and he’d go out to it and say, is this a right or a left, or a little further out, and he said try there, and I could feel underneath the leaves the tracks. And so we managed to go out to where he [Patterson] lost it, the end of the film, the whole way, and we could go right through there and find every track. Now, darned, it made quite a mess, but you couldn’t but know it was there, we knew we had the right place because you could tell a knot on a tree, or something to guide us by, so we knew we had the right place. And there was no indication of anything out of place, anything being buried, no indication of any equipment being in there. 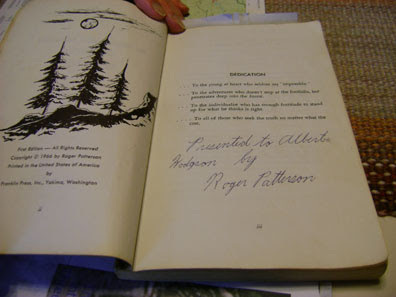 Images: Al's copy of Rogers book. Below, Bob Gimlin at the Yakima Bigfoot Round-Up, 2009. Photos: by Steven Streufert. BIGFOOT BOOKS: Well Bob Gimlin has said--and this is being quoted by M.K. and his associate people--Gimlin had said there was no way they could get heavy equipment in there save with a helicopter. HODGSON: No, no, there still isn’t. BIGFOOT BOOKS: But others claim that in fact there was a road right next to the creek. They have this picture with the truck in the back and it’s got logs on it. I don’t know if I have that with me. 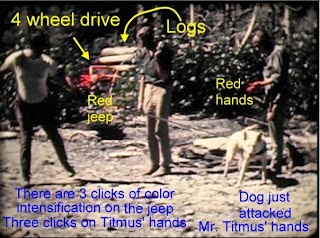 BIGFOOT BOOKS: See they’re claiming that this is the Patterson-Gimlin site, but that’s from the film that was taken by Rene Dahinden on the Blue Creek Mountain trip. HODGSON: That’s correct, because there’s the dog, the dog was with us. And that, looks like John. 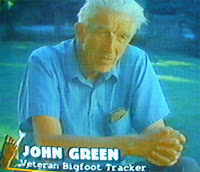 BIGFOOT BOOKS: That’s John Green. That’s known… And they claim this guy is Dale Moffit, the guy from Canada, who came down with John, and he’s acting as the dog handler, apparently. 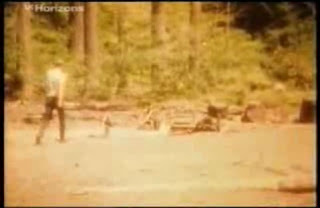 BIGFOOT BOOKS: It’s a fairly poor image, taken off of the internet. HODGSON: OK, let me turn that light on. BIGFOOT BOOKS: That’s the best print I could get of that image. Images: film taken by Rene Dahinden, from John Green's archives, lettering applied by MK Davis. HODGSON: Yeah. I can’t, I thought this might help but it don’t. BIGFOOT BOOKS: What about the one on the other side there? HODGSON: Nah, it almost makes it worse. 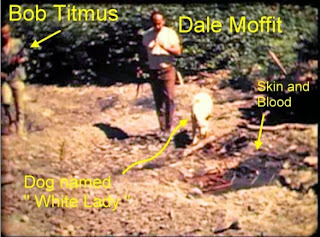 BIGFOOT BOOKS: This image here is the same guy, and you can see who they are claiming it is with the lettering above it there. HODGSON: Well, see, for some reason or other it blurs it. BIGFOOT BOOKS: But you can see who they are claiming it is there…? HODGSON: Well, it isn’t Bob Titmus, I know that. HODGSON: Well, you see, I was the one that caused this about Titmus. See I was mistaken, I had forgotten that it was Dahinden that went with him, not Bob Titmus. 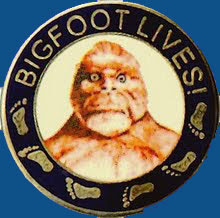 BIGFOOT BOOKS: And maybe they [MK, in an interview he did with Al] didn’t clarify which trip it was from, perhaps? HODGSON: Well, I dunno, but this is, Bob wasn’t on this trip, there’s no doubt about it. HODGSON: He was, I believe he was. BIGFOOT BOOKS: Are you aware of when he moved from Redding, or Anderson? BIGFOOT BOOKS: Up near Vancouver? HODGSON: Yeah, but his boat burned and he lost all of the casts. BIGFOOT BOOKS: Yeah, that’s a sad story, and all his research materials and stuff, too. But this is the guy who was actually there. [Al is shown “the pilot photo”] Would you say that looks like Bob Titmus there? HODGSON: No, no that doesn’t look like Bob Titmus to me, no. 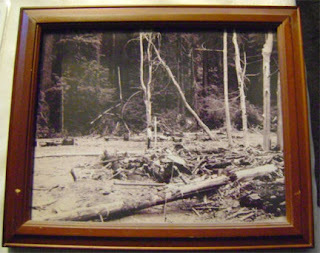 BIGFOOT BOOKS: That’s a picture from 1967, up on Blue Creek Mountain. HODGSON: No, that’s just too... no. BIGFOOT BOOKS: Well you can probably see that this is the same guy [the pilot], perhaps, based on his shirt rolled up and the pants? HODGSON: Yeah, I would agree. BIGFOOT BOOKS: That’s definitely not Bob Titmus in there. I mean, this is definitely a younger man that the Bob Titmus from 1963 on the other side there. HODGSON: And he looks taller than Bob, Bob wasn’t that tall of a man. BIGFOOT BOOKS: When you last saw Bob Titmus what year was that? BIGFOOT BOOKS: You probably knew him pretty well. HODGSON: I knew him fairly well, but I don’t remember when was the last time I saw him. HODGSON: He came down when, I think, John called him, or told him what’s going on, and he came down. The fact is Bob went up there afterwards, a couple of weeks afterwards, and got casts of some of the tracks he hadn’t cast. 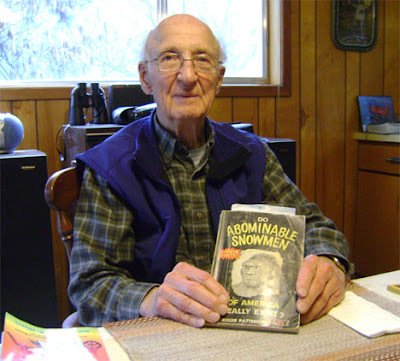 BIGFOOT BOOKS: Yeah, and Lyle Laverty, did you know him? He was one of the first guys who was on the site, he was working up there, and a few of the guys who were working on the projects up there…. But then the first actual (researcher)…. And Jim McClarin got up there, I guess, too? Images: Above and below--archival, historical: Bob Titmus, the Pilot, Lyle Laverty's famous Bluff Creek film site photo, and Rene Dahinden with McClarin's Willow Creek Oh-Mah statue, still extant on the Hwy. 299/Hwy. 96 junction..
HODGSON: Yeah, Jim did, too, and Jim of course is up in New Hampshire now, I think. BIGFOOT BOOKS: He was down in Sacramento, in politics, wasn’t he? HODGSON: He was a strange guy, a nice guy, but he was, what Unitarian or something like that, but he’s little bit different. I don’t know what to say about him or anybody. Now he was, at that time, he was carving that statue at Soldier Park. And he at that time he was carving it and he was mad at himself because went up and was hiking in the [Trinity] Alps or something and he came back out and found out it happened he was really mad. And so he immediately took off hitchhiking up to Yakima to see the film. BIGFOOT BOOKS: Nah, actually, I haven’t finished reading the whole thing myself. HODGSON: A lot of these books I have not read completely, you know. BIGFOOT BOOKS: But the parts that deal with Bluff Creek I’ve read those about fifteen times each. BIGFOOT BOOKS: So, you don’t remember when you last saw Bob Titmus. Did you see him after the film was made, perhaps? HODGSON: Oh I think so, but I can’t remember when. HODGSON: You know I have some pictures. I’m just going to have to hunt and see if I can’t find, of Bob and John Green, and I’m not sure I have any of Dahinden…. A lot of those guys I have pictures of. BIGFOOT BOOKS: Wow, I’d love to see any of those you have. A lot of them probably have never been published or anything. HODGSON: I understand they’re going to try to do a big deal this year for Bigfoot Days, and it might be, we may get to have all of those pictures, like the first ones of John and Bob Titmus and Rene, and even my friend [laughs, chuckles] Peter Byrne. Ah, Peter Byrne’s a bit different. I don’t know. I know he and John seemed to have a bit of a falling out. 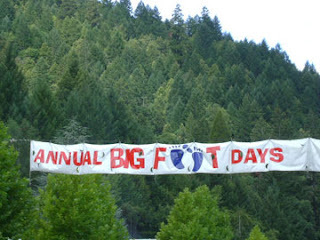 Image: The banner used each year for Willow Creek's community event, Bigfoot Days. Photo by Steven Streufert. BIGFOOT BOOKS: And they all seemed to hate each other…. BIGFOOT BOOKS: Yeah, I’m sure he’s heard that before because it’s out there now. Everyone refers to him as that. HODGSON: Yeah, he always had it just so-so, he always had a tie. And I understand that the reason he had that is he had something wrong with his throat. BIGFOOT BOOKS: Ah well, he was stylish [still is!]. It gave an image to bigfooting, wearing that safari outfit and a hat and an ascot tie. It would be great to see Bigfoot Days have more focus on Bigfoot. HODGSON: They want me to be Grand Marshall but I said, NO WAY. I’ve already been Grand Marshall twice. Images: Above and below, from the fine SASQUATCH ODYSSEY documentary. 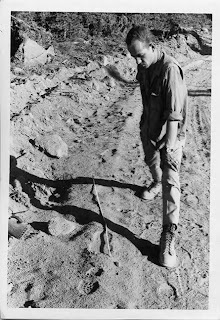 Below more, John Green on BCM trackway find, 1967, archival. HODGSON: Get somebody else! But you know what would be great, though? I don’t know if we can do it, but… get John Green to come down there. BIGFOOT BOOKS: Yeah, that would mean something... major. HODGSON: You’d have to take and uh, it would probably cost somebody, probably. Well, I think it would, now. BIGFOOT BOOKS: We’d have to really get the word out. A lot of the local people probably don’t know who John Green is. HODGSON: Yeah I can’t remember now. But anyway, John’s a good guy. I thoroughly think he’s a good, honest guy. He’s not gonna give you a bunch of malarkey. BIGFOOT BOOKS: Well, I’ve always felt the same way! I told you once before that I thought John Green was like the "Moses of Bigfooting," you know, holding the tablets but, um…. BIGFOOT BOOKS: …not to put him up on a pedestal. A lot of these people who believe in this “Massacre Theory” are coming out really slanderously against John Green, accusing him of lying. HODGSON: Oh, I know that. I know! I know! BIGFOOT BOOKS: I mean if they slaughtered a family of Bigfoot up in Bluff Creek, and buried it, then all the work that John Green did after that, all of his books, all the work of all these other guys, all of this was a lie to cover up something that happened in 1967! HODGSON: But you see… but you know, number one: if they buried that thing in the creek, that creek is now at least ten foot, it’s graded down at least ten feet. Now if it’s buried in there we’d have found bones somewhere, a bone went down the creek, somewhere it would have showed up. HODGSON: That’s right! We’d have found something. And the fact is it wouldn’t have taken it very long. Like I said, it’s eroded out. I was up there when they had the Symposium you could see where it eroded down, you could see where the old creekbed was, and it went down, and the reason was…. HODGSON: And that tells you there, but how come this was? This was right after the flood, right after our ’64 flood. And they went right up the creek and logged the creek, because all of these logs were in the creek and it was blocking the creek. So a fellow the name of Blake logged that creek. BIGFOOT BOOKS: You mean salvaging the logs that had been washed downstream? HODGSON: Yep, and some of them had washed down that had already been cut, and everything else. So they went right up the creek and logged the creek. So the creekbed, then, was left at a level way higher than normal. So then after, as the years went by, it graded down to its original bed, or what it maybe, I think it is now. So it’s probably, I’d say it’s close to ten feet now that it’s come down. Where they say is the film site is NOT the film site. It’s not the film site. Images: Museum promo photo of Al in front of the Bigfoot Collection building and statue; below, a map from Barbara Wasson's book, Sasquatch Apparitions; a government topo map of Lonesome Ridge. CLICK TO ENLARGE. BIGFOOT BOOKS: Well, Chris Murphy’s told us that he was going on your estimation of where the film site was. But then I talked with Daniel Perez, and Cliff Barackman and Bobo and those guys from the BFRO, and they say no, it’s upstream further. I talk to M.K. Davis or Sean Fries from Weaverville and they say no it’s a quarter mile downstream from that car landing spot. C.I. : So even in the spring of 1968 the access was up, or walking up along the creek? HODGSON: Yes, yes it was. There was no access from above. HODGSON: That’s correct, there was no evidence of it all the way up that creek, there was no sign. Now what confused me, we got up there, Mark and I went up the creek, we got up so far and here was a bridge. I said, we’ve gone too far, we’ve passed it. And then I find out that bridge was built afterwards. And that’s what throwed me. Now, you have to go up to that, above Notice Creek, go up to that first bridge, and get in the creek there and go up, to get to it…Now exactly whether I’d find it or not, I don’t know. HODGSON: But ya know, a fellow by the name of Kenny Pugh, in Orleans is the one that says, he says I know, you’re right, it’s not where they say it is. BIGFOOT BOOKS: and you probably walked up stream about less than a quarter mile or so and got to that big bend, where all of those big root balls are in the creek? BIGFOOT BOOKS: Well it’s hard to correlate a map to the ground if you’ve been walking on the ground all your life. HODGSON: Being in there so few times, you know what I mean? But I know that talking to Kenny he says that bridge was put in after the flood…. BIGFOOT BOOKS: But when you were up there did you feel you were at the right spot in 2003, with those guys? I heard that Gimlin didn’t necessarily recognize it too much either. 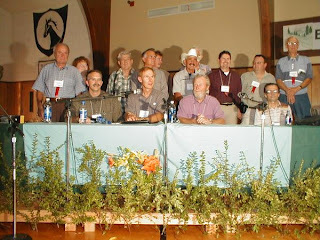 Image: the panel of speakers for the 2003 Willow Creek International Bigfoot Symposium, including Al Hodgson, Bob Gimlin and John Green (standing behind Gimlin in this photo, unfortunately). HODGSON: I was, I didn’t think…. Even before that, there was no road to come down to the creek at that time. BIGFOOT BOOKS: Well, we’re trying to figure out…. That road was apparently built for a clear cut…. HODGSON: What was it, I think, it was a special road that came in there. They undoubtedly had a special landing there, and hauled up at that spur. Now there would be no reason to put that road in afterwards, so it had to be there before. And it wasn’t there, when the film site…. So the film site was some other place. Now, exactly where, in fact, was it even below that site, because we didn’t cross it when we went up there. BIGFOOT BOOKS: Hmmm. You mean when you walked up the first time, up the creek? BIGFOOT BOOKS: You were with your son when you did that? HODGSON: No, that was the second time, that was just a few years ago. The first time was John Green. BIGFOOT BOOKS: And when you went with John Green you had to go up the creek all the way? HODGSON: That’s right. That’s right. BIGFOOT BOOKS: And, you know, he had Jim McClarin walk… Were you there when he made that film with Jim McClarin walking the trackway? HODGSON: No, I don’t think so. Images: from John Green's film site follow-up, featuring Jim McClarin walking and superimposed with the Creature. BIGFOOT BOOKS: Hmmm. Well, I’m pretty sure that was made on that trip. Anyway, he had a camera and he was filming and was trying to compare the exact location where Roger had shot the film. And he had Jim McClarin, who was like six foot five walk in the trackway, and then he lined them up just as perfectly as he could. But it’s obvious that that’s the right film site, that he found then? BIGFOOT BOOKS: It’s well known to be John Green’s. But maybe he went on the trip with Al, and then he went in on another trip? BIGFOOT BOOKS: Oh, well isn’t that your son there? BIGFOOT BOOKS: That would be Mike…? HODGSON: That’s was Mike, yeah, when he was going to Humboldt State, I think. BIGFOOT BOOKS: Did John Green take this photo, too? HODGSON: That is definitely the correct film site. BIGFOOT BOOKS: And from where you were in 2003, where do you think the correct film site was? HODGSON: It was downstream from where we were at. BIGFOOT BOOKS: You can’t quite gauge the… because you were on two different trips you don’t really know the distance between them? HODGSON: The best thing I think is check with my friend. BIGFOOT BOOKS: He’s still around in Orleans? In the phone book? HODGSON: Yeah, I think so. Kenny Pugh. He’s a nice guy. Images: Al's framed Peter Byrne photo featuring Mike Hodgson on the film site; middle, from I.C. 's GPS unit, the Bluff Creek headwaters; below, the film site seen from upstream of the "big bend." Photos, first and last: by Steven Streufert. HODGSON: I agree with you. But it makes a difference, though. In a way. BIGFOOT BOOKS: Well, we have a hunger just to find the right place and settle it. Before it’s too late and no one who was there can go up there and say this was the right place…. HODGSON: Well, I certainly agree with you. I agree with you. I think that’s the best bet right now, and I would love to go with you. But I don’t think I can. Ahhh… I think I can. But I don’t think my son would go with me. BIGFOOT BOOKS: Well, maybe this summer? C.I. : The current road down from the ridge is usually in good shape for a good four wheel drive. You can get there without too much trouble. But then, it will take some bushwhacking up and down the creek to try to find the location. 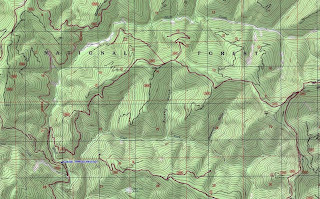 But it would certainly be closer, from your look at the map, be closer to start there and go downstream than to come upstream from the Notice Creek bridge. HODGSON: I honestly don’t know. He came, he was stationed here in Willow Creek for some time, and that’s how I got to know him. He was stationed for some time in Orleans, and then he retired up there, and I can’t really tell you exactly. HODGSON: Well, way UP from the creek. It was way above the creek. BIGFOOT BOOKS: It wasn’t down in the creekbed? BIGFOOT BOOKS: There was not any kind of road there? Because this picture here was supposedly taken on the sandbar just southwest of the film site, because there are trucks there. Well, maybe we’re all wrong assuming that was where this picture was taken? BIGFOOT BOOKS: Up on the ridge? HODGSON: Up on the ridge. HODGSON: But this is not the creekbed! That’s a road right up on top of the ridge. 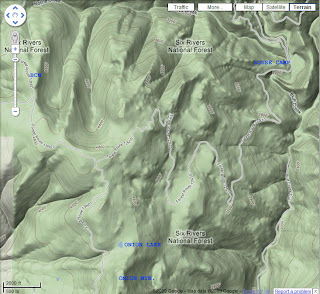 BIGFOOT BOOKS: A couple thousand feet at least up from there…. HODGSON: I tell you there’s a guy, if he’ll talk to you, I don’t know if he will or not. He was the one who discovered those tracks, on Blue Creek Mountain. He lives in Hoopa, he’s an Indian fella, I don’t know if he’ll talk to ya, I don’t know…. BIGFOOT BOOKS: He was there on that work crew? HODGSON: I believe that he was the foreman on that road at that time. And he told me, Al, I was the last man out that night, and I was the first one in the next morning, and those tracks weren’t there. And it was a long ways down there if anyone had come in by foot. And it had sprinkled a little bit, and you could see there was no new tracks when he came up the hill, there were no tracks except for the tracks in this dust. 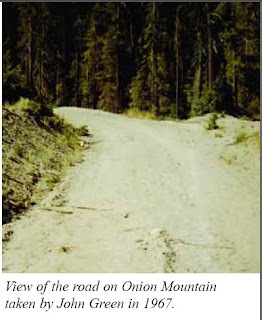 BIGFOOT BOOKS: As I understand it, maybe you would know better, the Onion Mountain Road went down to Louse Camp eventually, and then they started building the road over Blue Creek Mountain…. HODGSON: Yeah , they changed the roads all around. I don’t know how exactly they changed them, but they changed the roads all around. BIGFOOT BOOKS: And that road was being plowed through, a new road, I think John Green’s book says it was a new road being built, and that’s why the tracks were so fresh there in the dirt. HODGSON: A lot of things happened there. The flood had done such a number on the roads that they went in and put the roads someplace else because of slides and so forth. BIGFOOT BOOKS: You mean the roads that went down below more? 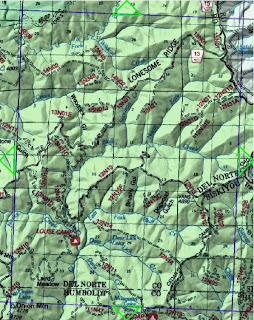 Image: Terrain map containing the Onion Mountain to Blue Creek Mountain area, down to Louse Camp. HODGSON: They stayed back out of the creek. Exactly how they went I don’t know. I was up there several times before that and then I was up there a few times after, but not too many. 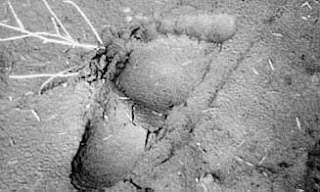 BIGFOOT BOOKS: What’s the name of the Hupa man you said found the tracks? HODGSON: Yeah, I think that was his show. He might have been subbing for someone, I don’t know. BIGFOOT BOOKS: I have a timeline here of events from 1967. BIGFOOT BOOKS: This is all taken from John Green’s book. He says in February of 1967 he came down with Rene Dahinden. He says they stopped to visit Roger Patterson in Yakima, and then he says they came to Willow Creek, and they heard of some recent [BF] activities, and they met Syl McCoy, in February of that year. Had you, at that point, had you met John Green? You must have met Rene Dahinden? BIGFOOT BOOKS: I mean, in the 1958 business, right? HODGSON: No, ’58 I did not know all of those guys. At that time I just flat out thought it was a hoax and had nothing to do with it. [Laughs Out Loud] And so, I did not know them. 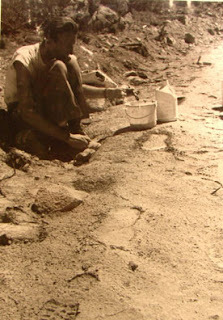 Images: Syl McCoy at Hyampom with track casts found there; an old post card of Willow Creek, part of Hodgson's Department Store is seen in the lower left corner. BIGFOOT BOOKS: And so, you were running the store and probably got a lot of reports coming in at that time….................? KEEP CHECKING BACK (or just subscribe)! Transcribing this is an incredibly hard slog. This is only the first THIRD or less of the interview. Con-texts of this blog, save for archival or historical images (fair use for research), copyright 2010, Bigfoot Books Intergalactic and Steven Streufert. Please feel free to quote with citation and link to this blog included. ... is still hibernating this week. He was mad enough last time in regard to those film guys. Were they working for Tom Biscardi, or what? Thank you for all of the time and effort put into this interview, I look forward to the next part. 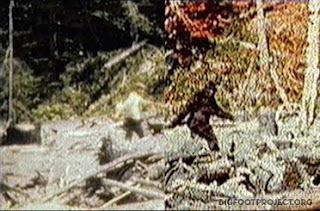 It is amazing to me that people who were not there at the time or even near the time of the filming of the Patterson/Gimlin film seem to think that they know things that are simply beyond any rational thinking at all. Mr. Hodgson has helped to set the record straight. I was the pilot of the Cessna 185 that flew John Green, Rene Dahinden and Dale Moffit to Bluff Creek on the 28th August 1967 returning to Chilliwack on the 31st and still have my pilot's logbook to prove it. The photo does not show Bob Titmus but me aged 24. I have posted some photos on other Bigfoot websites. The theory that a massacre took place is laughable! Dear Pilot, Do please contact me at bigfootbooks@gmail.com . I have some important questions to ask, and would like it if you would go on record with what you said above. This is important, to defend the names of Green, Gimlin, and others from this slanderous theory. Thanks! "I was the pilot of the Cessna 185 that flew John Green, Rene Dahinden and Dale Moffit to Bluff Creek on the 28th August 1967 returning to Chilliwack on the 31st and still have my pilot's logbook to prove it. The photo does not show Bob Titmus but me aged 24. I have posted some photos on other Bigfoot websites. The theory that a massacre took place is laughable!I was the pilot of the Cessna 185 that flew John Green, Rene Dahinden and Dale Moffit to Bluff Creek on the 28th August 1967 returning to Chilliwack on the 31st and still have my pilot's logbook to prove it. The photo does not show Bob Titmus but me aged 24. I have posted some photos on other Bigfoot websites. The theory that a massacre took place is laughable!" Great job. I really enjoyed reading this first part, and can only imagine how time consuming it must be to transcribe it. I got your link from The BFRO site, and am very glad I did. Thanks so much. Mark. I just stumbled onto this site from BFRO. Great Job. I had never heard of the "massacre" theory. Seems absurd, though, considering having the body would be the greatest anthropological find in world history. Unless, of course, they actually thought they had killed a human being. Over forty years, and they still can't debunk the film. I wish I could move to northern California and live in your shoes for a while. Your very fortunate to be doing this. Don't give up. I too have come across the "Massacre" crap. How utterly Insane. It is too bad that you have to spend time 'debunking' what mental illness throws up. The idiots who push the 'massacre' crap are tearing down credibility of any Sasquatch study. Shame on them, or Shame on everyone who indulges thier mental illness. 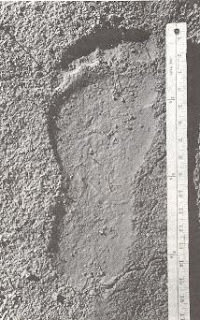 the bigfoot print in the article looks like a print from a carved wooden foot by ray wallace. after his passing, one of his kids was interviewed, and he holds up a sample of the old man's handiwork. it is has very oddly shaped unnatural looking square toes. just like this print. i've been looking at some of the bigfoot massacre older posts. much was previously promised re disclosure but the massacre camp seems to be releasing information in very coy little dribs and drabs. the utube films are especially frustrating, innuendo and no responses to questions. i guess at a certain point gimlim/green would have a legal case for harassment (?) and that is why davis et al have avoided ever clearly stating their case. but can you sue someone for saying you killed (what society thinks is) a mythical beast? so it's all so abstract. "I was the pilot of the Cessna 185 that flew John Green, Rene Dahinden and Dale Moffit to Bluff Creek on the 28th August 1967 returning to Chilliwack on the 31st and still have my pilot's logbook to prove it. The photo does not show Bob Titmus but me aged 24. 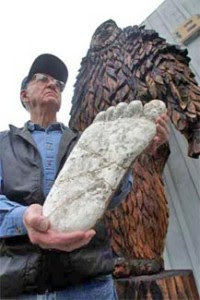 I have posted some photos on other Bigfoot websites. The theory that a massacre took place is laughable!"